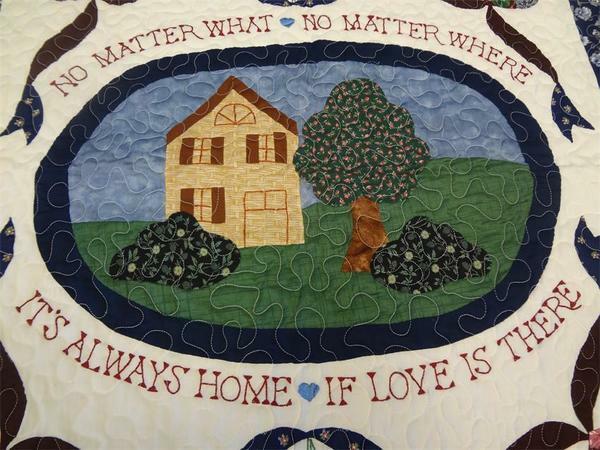 The words on this quilt - "No matter what, no matter where, it's always home if love is there" - describe one of the values that the Amish celebrate most: their dedication as a group to family, to home, and to love. With a rod sleeve along the top for hanging on a wall, this quilt is lovingly handcrafted by an Old Order Amish seamstress who has been making quilts for most of her life. This ever-popular design stays strong thanks to the power and simplicity of its beautiful message. This quilt makes a perfect give for newlyweds, new parents, or family members. If you've any questions about this piece, please get in touch - we would love to hear from you.